"Some of you may be wondering - "What's up with this unhealthy obsession with the number 7?" This page offers some insights." "Cause that's the best number. It's like rock. Nothing beats rock or 7." Bungie has long enjoyed using the number seven (7) in its games in many prominent ways. Ensemble Studios and authors also have certain obvious seven references in their works about Halo. While almost anything can be made into a reference to something with effort or constructed accidentally through pareidolia, the following attempts to list the intentional references Bungie placed into Halo for the fans to find. As such, not all of these references may be fully accurate, and many of them may be proven to be false at any time. Bungie's obsession with the number seven may be attributed to 7 being considered a lucky number in Western culture. In spite of the fact that the number seven is featured extensively in Bungie's work, it has generated an aura of apophenia. This cultural nuance can be compared to the 23 enigma. After 343 Industries took over the Halo franchise in 2011, references to 7 have continued, possibly as an homage to Bungie. John attended Elysium City Primary Education Facility Number 119 before being abducted for the SPARTAN-II Program. 119/7=17, 1x7=7. John's SPARTAN tag is 117 (1x1x7=7). Deja showed the children a hologram of a meadow with 7 wolves hunting a moose. The Medical Facility "Hopeful" was gone for 7 days. The human colony Jericho VII is introduced. VII = 7 in Roman Numerals. A UNSC destroyer was only 7 meters longer than a frigate. Lieutenant Hall has written 7 physics papers on Slipspace communications. Four Covenant frigate ships are an even match with 7 UNSC destroyers. Hall reports a collision in 7 seconds. After the UNSC Cradle sacrificed itself, the rest of the fleet destroyed seven Covenant ships with their MAC volley fire. Jacob Keyes could only count 7 UNSC vessels still intact after the Battle of Sigma Octanus IV. When the SPARTANs test the MJOLNIR suit with shields, when John-117 gets ready to go outside there are 7 ODSTs standing outside around the tent. The UNSC Pillar of Autumn carried 7 C709 Longsword-class Starfighters. 7 Covenant frigates were pursuing the Pillar of Autumn. On page 11 of Halo: Fall of Reach - Boot Camp, Halsey is seen looking at a hologram of John-117's physique, with a few genes labeling around it. Each of these labels are seven nucleotides long. 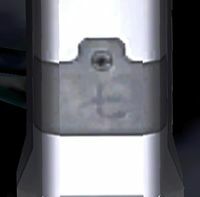 七, the Chinese character for 7, is visible on the M6D Pistol's ejection port. When the Chief's shield is down, it takes fourteen seconds to fully recharge - seven seconds while the shield flash red, and seven seconds while recharging. At the beginning of the second level, there are seven dead bodies around John-117 (six marines and the lifeboat pilot). On the level "The Silent Cartographer," at Bravo 022's crash site, there is a fully loaded rocket launcher (the first in the game) and 7 spare rockets. At the beginning of "The Silent Cartographer," John-117 stormed the beach with seven marines. There are 14 Shade turrets on the campaign level Truth and Reconciliation. 14/2=7. In the cavern with the bridge in the level "Assault on the Control Room", there are seven dead marines as well as some dead Covenant troops. Installation 04's monitor 343 Guilty Spark is introduced. His name is derived from the value 343, which equals to 73. There are 7 blast doors leading to the Activation Index in the Library. On the level Keyes, once the Chief gets back into the Gravity Lift bay, there are 7 dead Grunts around. The Proto-Gravemind has 7 tentacles. After destroying the fusion core on the Pillar of Autumn, Master Chief drives a Warthog through a Class 7 service corridor. The last Longsword on the Pillar of Autumn was in Launch Bay 7. Cortana's warns the Chief about the gap in the trench starts when he is 700 meters away from Launch Bay 7. On Easy difficulty, it takes exactly 7 shots from a plasma pistol or a plasma rifle to kill a Sangheili. It takes at least seven needles from the Needler to make an explosion. On the third page of the manual explaining the HUD (page 15), a screenshot with an explanation of the scope shows 7 extra bullets in the sniper rifle. Carol "Foe Hammer" Rawley is part of a group of 7 people (3 pilots, 3 ground crew, and herself) who fled the Pillar of Autumn by retrieving their Pelicans rather than taking lifeboats. "Twelve shots rang out, and seven Grunts fell." Silva wishes he had 7 Lt. McKay's. All the terminals' number codes on the Pillar of Autumn have a 7 on them. There are 7 Covenant ships in the system after Halo's destruction. The Covenant flagship Ascendant Justice has seven plasma turrets. After Corporal Locklear brings the ammo up from the Pelican, there are seven grenades in the crate. Cortana describes subsection seven of the Cole Protocol as the reason they cannot immediately return to Earth aboard Ascendant Justice. After Fred and Kelly steal two Wraiths, they destroy seven other Wraiths. There are seven doors leading to adjacent offices and surgical bays when Dr. Halsey first enters the medical wing of CASTLE Base. As she is deleting Araqiel, Dr. Halsey taps the level seven security barriers. The Ascendant Justice exits Slipspace seven hundred thousand kilometers from the Epsilon Eridani System center. CPO Mendez was scheduled to meet the Spartans 0700 hours after they captured the flag from Tango Company. There were seven service drones aboard the Gettysburg. Admiral Danforth Whitcomb bluffs Governor Jacob Jiles by saying they had 7 working plasma turrets. The dead crew of the Gettysburg is placed in cargo bay seven. After exiting slipspace in a captured Covenant dropship, the Spartans find themselves near two hundred forty-seven Covenant ships. As they are watching, seven more appear. The Master Chief sets his Lotus anti-tank mine detonator for seven seconds. C-7 foaming explosive is used by the Spartans and Locklear. The SPARTAN-IIIs of Beta Company had been launched from Slipspace seven hours previous. Seven Covenant cruisers appear during Operation TORPEDO. "Seven other men sat at a card table, shaking off the effects of the flash-bangs." "Three hundred Spartans hit the dirt at 0700." After two days the Spartan-III's of Alpha Company had managed to disable 7 of the reactors. "On day seven," the Admiral said, "additional Covenant reinforcements arrived." Kurt trained the Spartan-III's of Alpha Company for 7 years. "We are presently seven kilometers over the planet's surface," the AI said. Before casualties, there were 7 active Spartan-III's on Onyx (Tom, Lucy, and Team Saber). After boarding Bloodied Spirit Fred's MJOLNIR suit has only seven minutes of air remaining. When Bloodied Spirit is attacked by Onyx Sentinels, the Sentinels move into lines of seven. Seven of these lines then combine into an elongated triangle and fire. Chapter 27 begins at the seventh cycle, 49 units, Covenant time. 72=49. The Unggoy Kwassass had served seven years in the Covenant. The structure where the Spartans land is a seven-sided faceted dome with seven arches. Inside are seven flat surfaces, each the size of carrier landing decks. "It will take seven minutes in this orbit to cover that area." "The seven Sentinels adjusted their aim and their spheres glowed red, amber, and then glistening gold." Dr. Halsey said the portal would close in 1 hour, 17 minutes, this is equal to 77 minutes. The teleportation pads around Onyx are seven-sided. "Shockwave from surface detonation impacting far side of the moon in seven seconds," Durrono said. In the Halo 2 announcement trailer, when Master Chief walks in to hangar and launches himself into space, above the door to the hangar is labelled "A-07". There is a clearly visible 7 scratched into the left cheek of Miranda Keyes. Sergeant Banks' communicator is engraved with the Hindi word for 7, written in the Hindi script. When the UNSC In Amber Clad was in the Battle of Earth numerous units from the 77th Marine Regiments are on board. The ODSTs seen in-game belong to the 7th Shock Troops Battalion. There is a 7 on the lower part of a Pelican's ramp. Installation 05's monitor, 2401 Penitent Tangent is introduced: 2401 is 74. It can also be read as 2+4+0+1=7. The Gravemind speaks mostly in heptameter, a poetic style with 7 meters per line. In Halo 2, there are 7 Covenant races seen: Unggoy, Kig-yar, Yanme'e, Mgalekgolo, Jiralhanae, Sangheili, and San'Shyuum. In Halo 2, there are 7 Covenant vehicles: Ghost, Spectre, Wraith, Type-29 Shadow, Banshee, Phantom and the Scarab. The symbol on the Banshees' wings is made up of 7 red blocks. 7 hexagons make up the zoomed targeting reticule of the Covenant Carbine. Firing the Plasma Rifle until it overheats will drain 7 power units, assuming it is not burst fire. Firing the Sentinel beam until it overheats will leave a remaining charge of 77. There are 7 drivable vehicles in the game: the Scorpion, Wraith, Spectre, Standard Warthog, Gauss Hog, Ghost, and Banshee. In the Halo 2 Vista, the "Silent But Deadly" Achievement requires the player to kill 7 enemies from behind without being spotted. The player fights in 7 levels as the Master Chief: Cairo Station, Outskirts, Metropolis, Delta Halo, Regret, Gravemind and High Charity. Cairo Station's serial number ODA-142 contains a possible 7 reference (1+4+2=7). The UNSC In Amber Clad's Hull Classification Symbol is FFG-142, which is a possible 7 reference. (1+4+2=7). The Covenant antimatter charge that was brought onboard Cairo Station took 7 seconds to detonate. In Outskirts, a sign bearing the number 7 can be found nailed to the wall near the Blind Skull. On Outskirts, in the small dark room where the IWHBYD skull is located, there is a number 7 on the wall. To obtain the IWHBYD skull, one must face 7 waves of Sangheili Ultra, with 7 Sangheili in the 7th wave. In the level Outskirts, there is a total of 7 Shadows. There are 7 Phantoms in the levels Outskirts and Metropolis combined. Throughout the levels Outskirts and Metropolis the player can find numerous cases of VX 7 nerve gas. There are 7 levels of caskets in the Mausoleum of the Arbiter. In the level Delta Halo there are 7 dead ODSTs scattered throughout the level. In a deleted scene, a longer version of the cutscene at the start of Sacred Icon, Truth and the Arbiter were viewing 7 murals that showed how the Covenant had grown. John-117 faces 7 pairs of Mgalekgolo in the campaign level Gravemind. In the level The Great Journey there are 7 Shade turrets. At the end of the credits the "t" is replaced with a 7 in the sentence "And a whole load of people we didn't get time to 7hank". The phone booths on Terminal are all numbered 7. The multiplayer map Terminal has a large 7 on the station building. The Broadcasting station for the multiplayer map Terminal is Channel 7. On Headlong, near the bridge which connects to the Needler Building, there is a piece of paper with the number 7 pinned on the wall. In Headlong the number 7 is nailed by the side of the door on the building that contains the Energy Sword. On the level Zanzibar, the Xbox's clock must be on 7:07 for the player to see the Easter egg of Ling-Ling's head. In the background of the Collector's Edition of Halo 3, the door behind the Chief has a 7 written on it. In an ad for the Halo 3 guide that occasionally shows up on Bungie.net, "07" is stenciled in white on the Pelican behind the Master Chief. The art is also used as the cover art of Collector Edition's game manual. 7 covenant species are in the game manual. In the level Arrival John-117's arm is seen after 77 seconds. There are two sevens on the side of an Unggoy Minor's armor. There are 7 scoped weapons: Battle Rifle, Sniper Rifle, Beam Rifle, Covenant Carbine, M41 Surface-to-Surface Rocket Medium Anti-Vehicle/Assault Weapon, Fuel Rod Gun, and Spartan Laser. The M6G Magnum has a Korean Hangul symbols on the barrel, and the very bottom of the mag. When reflected, it translates to the number 7. The SMG has a scratch in the shape of a 7 (easier to see if weapon is aimed at sky or near a light source). There are seven symbols on each end of the handle on the Energy Sword. On the side of the Warthog, below where the driver and passenger get in, just above the side skirts, there are 7 dashes. The Troop Transport Warthog is shown to have a total of 7 seats, whereas in-game there are only 5 available slots. It takes 7 seconds of the AV-14 Hornet's twin-linked rotary cannons to destroy a Warthog. The UNSC Forward Unto Dawn has the number 7 on the front of it. It takes 7 seconds from being infected by a Pod infector to turn into a Flood combat form. There are 7 levels that the Cortana and Gravemind Moments occur. There are 7 Forerunner terminals in total within the campaign. Finding all 7 terminals unlocks the Marathon Man achievement. The Forerunner Dreadnought has 14 x 14 x 14 dimensions. 14 = 7+7. In the level Crow's Nest, in the ops center, the emergency power generators on the far side of the room, where one needs to go to get the Black Eye Skull, have the writing "EPG 2401": 2401 is 74. At the beginning of the level Crow's Nest, some of the monitors have "Sector 331" written in a corner. 3+3+1=7. In the level Crow's Nest, on the walkway above the barracks there is a box with a large red 7 written on it. In the level Crow's Nest, a rocket has the number 7 on each side. In the level Tsavo Highway, John-117 exits the base through door number 7. In the level The Storm, there are seven plates of metal grinding on the cranes used to board the first Scarab, including the elevators. There are seven pallets on the pathway with the missile pods on the level The Storm. The are seven pipes the player can walk into on the lake bed where the Scarab was fought. There are 7 pairs of monoliths around the Portal. There are 7 usable vehicles on the level The Ark, the seventh level of the game, including Arrival. In the room with Installation 00's Cartographer, there are 7 trapezoids above the doors. In the opening sequence of the level The Covenant, there are 7 drop ships: 5 Pelicans and 2 Phantoms. There are 7 Jiralhanae Chieftains and Jiralhanae War Chieftains combined in the level The Covenant. In the level The Covenant, there are 7 Sangheili assisting the UNSC forces (excluding the Thel 'Vadam, N’tho ‘Sraom, and Usze ‘Taham). There are 7 Gravemind moments on the level Cortana. In the level Cortana, in the beginning of the cut scene in which Cortana is rescued, there are 7 seconds of silence before she says "You found me". It takes 7 seconds for 343 Guilty Spark to explode after being dealt the fatal shot in the level Halo. During the Warthog Run in the level Halo there are 7 vehicles other than the Warthog: 4 Ghosts, 1 Mongoose, and 2 Choppers. In the credits, Bungie frequently replaces the letter 't' with the number 7. On the multiplayer map Sandbox, the Golf Club is called a 7-wood. Deaths that do not require two people have a seven second respawn when no other penalties are active. All of the computers placed in Forge display a very hard to read paragraph. However, it is easy to make out several 0'7s in the writing. In matchmaking, there are 7 pieces of equipment that can be used. Cold Storage is the seventh downloadable Halo 3 map, and was released on Bungie Day (7/7). In the Cold Storage Transmission the time elapsed since an outside agent accessed the delta site has an approximate seven year margin of error. There are 7 structures coming out of the bottom of the building the multiplayer level Epitaph is set in. The Multiplayer map Epitaph has 7 hologram projectors, 6 minor ones and a Guardian Sentinel resembling projector. In the multiplayer map "Foundry", at the wide end of the map there are 14 full squares in between the walls, 7 on each side. There are seven pieces of grating involved with the missile launcher scenery on High Ground (including the one placed under the aiming machine). On the 'fire point' sign on High Ground there are 7 licks of flame coming from the white triangle. There are 7 lines of text on the screen of the gate switch on High Ground. Last Resort is set in Zanzibar Island's Wind Power Station 7, which houses Municipal Turbine 7. At the bottom of the 'pit of death' on the multiplayer level Orbital, there are 7 purple lights randomly scattered (excluding the ring of 6 lights, which have a darker shade of purple). The center screen in the sword room on the multiplayer level The Pit features the name sector 331. 3+3+1=7. It takes 7 seconds for the screens in The Pit Ops Center to scroll through all of the visuals. There are 7 bellows of smoke on the horizon in the multiplayer map Rat's Nest. In the multiplayer level Sandtrap, the UNSC Aegis Fate has a number 7 surrounded in a star on the side. On Sandtrap, there are 7 standing angled pillars on the long indoor walkway. There are 7 Vidmaster achievements; 4 achievements can be found in Halo 3 while the other 3 are in Halo 3: ODST. There is the Vidmaster achievement "7 on 7". The Legendary Map Pack banner on the official Bungie.net has a slogan saying: Tru7h. Carnage. Bungie. The Art of Halo 3 was released on November 25, 2008 (2+5= 7). In Halo 3 and all subsequent mainline games after it, players have 115 hit points: 45 health points and 70 shield points. 1 + 1 + 5 = 7, 70 ÷ 10 = 7. Cortana signs her second letter with seven 'X's and 'O's. Cortana sends eight emails. But Letter Three was likely never intended, so seven messages were planned. While Ilovebees was technically created by 4orty2wo Entertainment rather than Bungie, it is highly probable they were aware of and continued the tradition. When the Apocalypso crashes, all communications in the solar system are disabled for about seven seconds. When players unlocked 777 axons, a voice-actor playing Melissa joined the game. When Kamal Zaman accesses his voice mail, he has seven old messages. Hiro, reading a how-to book on dating, tells Kamal to skip to chapter seven. A part of the game had players guiding the Sleeping Princess out of her "glass coffin", a prison in her mind appearing as a story-tale world. Players would have to guide her down various paths marked by signs with unusual markings. The correct paths are Deadly Sins (there are seven), Waves (seven seas), and Skinny Cow and Fat Cow (in the Bible, the Pharaoh had a dream about seven skinny cows that ate seven fat cows). Trevor planned to make chatters for 7% of what they cost in convenience stores. As of 2004, Aunt Margaret had been beekeeping for seven years. Yasmine Zaman's augmentations are performed in Lab 7. Later, George Shebura received "7 more parking tickets" in one week. Hiro tells Kamal "that's like the seventh time today you've refused to answer your chatter." Durga analyzed Jersey's food-buying habits over the last 7 months. There were seven space elevators of the Tiara. Seven main maglev train lines led out from each base of the space elevators. Prophet Senior Ministry staffers could manage to travel in their anti-gravity chairs in groups as small as seven. During the evacuation of Harvest, Loki changed the five minute interval for the containers to seven minutes. The first space elevator to collapse was the seventh elevator. Sif's electronics were stored in seven towers in the Tiara's control room. First contact with the Covenant was made on January 17, 2525, i.e. 1/17/2525. 1 x 1 x 7=7. 2+5=7. Seven ODST's were killed during the attack on the Redoubt. There are 7 Sangheili deactivating camouflage in the Halo Wars Announcement Trailer. In Halo Wars, both the UNSC Fortress and Covenant Citadel possess 7 expansion sockets. There are 7 types of buildings for each UNSC and Covenant. In the beginning of level Relic Approach, the lockdown on the Alpha Base will not end and the main gate will not open until the player trains five more squads of marines, bringing the total to seven. When playing on Easy or Normal the player begins the level Arcadia City with seven units: six Hornets and Sergeant Forge. The player begins the level Scarab with exactly seven units: 2 Rhinos, 2 Marine squads, 1 Scorpion, 1 Warthog, and Sergeant Forge. There are 7 power nodes that you can destroy to make the Super Scarab's searchlight move slower on the level Scarab. The player begins the level Beachhead with exactly seven units: 4 ODST squads, 1 Hellbringer, Sergeant Forge, and Professor Anders. Following the events aboard the UNSC Prophecy, Sergeant Forge required seven doses of anti-radiation treatment. At approximately 10 seconds into the ODST trailer there are 7 SOEIVs burning in the atmosphere. In the Keep it Clean trailer, it takes the Superintendent 7 camera views to chronicle the Rookie's SOEIV pod crashing. In the Keep It Clean trailer, there are seven Jiralhanae in the Covenant patrol. In the Keep It Clean trailer, the soundtrack that plays is 77 seconds long or 1:17 minutes long, a seven/SPARTAN-117 reference. The Superintendent will change his face 7 times during the trailer (including its beginning emotion). There are 7 protagonists in Halo 3: ODST. The Rookie's enlistment date is 07/07/2547. (07/07) This is also a reference to Bungie Day. There are 7 Olifants in the game, including the destroyed ones. There are at most 7 supply caches available to the Rookie in the level Mombasa Streets. Several screens which the Superintendent uses to direct the player in Mombasa Streets feature the numbers "49.2.7" before switching as the player gets close. The watchtower of the bridge outside the ONI Alpha Site's compound is number 07. There are 7 pairs of bridge supports between the two ends of the bridge outside the ONI Alpha Site. The landing pad on the roof of the ONI building has the number 43 on it, (4 + 3 = 7). In the beginning of the level Data Hive, the Rookie starts on Sublevel 7. The number of the Olifant used by Veronica Dare and the Huragok containing Vergil is 49, or 72. In the ending cutscene of Coastal Highway there are 7 Covenant cruisers above New Mombasa. In the Legendary Epilogue cutscene, there are 7 Huragok looking down into the Forerunner structure. In Firefight, the player starts out with 7 lives. In the Firefight, there is a total of 7 gold skulls. There are 7 playable characters in Firefight, including Sergeant Johnson. In the side-story in the game, Sadie's Story, the number of the train Sadie Endesha boards at the very beginning is 14, or 7x2. In the side-story in the game, Sadie's Story, Dr. Daniel Endesha sees 7 Huragok who escaped the Covenant. When Baird first exited the medbay he ran into seven Covenant soldiers (4 Unggoy, 2 Kig-yar, and 1 Elite). Roland-B210 and Jonah-B283 take seven days to reach the Covenant dig site. When Jonah detonates the explosive charges, six Spec Ops Elites and himself are killed, making seven casualties. A Sangheili combat form was brought down "not seven meters from them." John-117 fights alongside members of the Eridanus II First Battalion, Seventh Regiment. John-117 was less than seven meters from a Kig-Yar when its head snapped to the side. Preston Cole was one of seven children (four boys and three girls). Preston Cole's student ID account was 00034. 0+0+0+3+4=7. Ensign Alexis Indara begins management training (Series 7) following the CMA Season of Plenty's bi-annual personnel review. Cole was called before a Board of Inquiry at the Academy at Mare Nubium on June 7, 2492. The UNSC Destroyers which participated in the Callisto Incident in 2494 carried only 7 Ares Missiles. During the Skirmish at Theta Ursae Majoris the UNSC Gorgon had seven Pelicans on standby. "The scattered debris of seven destroyers, however, continued on their previous trajectories." The Announcement Trailer was 1:17 minutes, or 77 seconds long. At the main title screen, while various battle sounds are playing, occasionally a clear seven shot burst from an Assault Rifle can be heard. Players begin the game with 7% armory completion. If a player did not purchase the Limited or Legendary editions, the player will only have access to seven Sangheili armor permutations. There is a clearly visible 7 on the Limited Edition black box and on the Legendary Edition. The Halo: Reach limited edition Xbox 360 controller and wireless headset are both marked with the requisition number "//65|59_234|97///". On the headset, directly before the requisition code, is a larger number 7. The achievement "KEEP IT CLEAN" requires the player to kill 7 Moa in the second mission of the game's campaign. There are 7 Firefight achievements in the game. The Noble Map Pack includes 7 achievements. Emile-A239's Spartan tag is another reference to seven, 2+3+9=14, 14/2=7. There are 7 armor abilities: Sprint, Armor Lock, Jetpack, Active Camouflage, Hologram, Drop shield, and Evade. The model number of the DMR is M392 (3+9+2=14 and 14/2=7). The Target Locator calls in 7 missiles from orbit. Anchor 9 is armed with 7 Point Defense Guns. The Collar/Breacher chest attachment has 7 shotgun shells attached to it. There are a total of 7 Scarabs in gameplay, including ones in background battles. Three in the level Tip of the Spear and four in the level Pillar of Autumn. In the mid-level cutscene of the level Winter Contingency, the assault rifle Carter kicks to Noble Six has seven rounds in its magazine. In the beginning of the level Nightfall there is a poster in the first building with 35 black-colored people and 1 red-colored person on it. The red person is on the bottom row 7 places from the left. 35/5='7. On the level Tip of the Spear, the grenade launcher starts off with 7 grenades in Cooperative play. The player begins the level Exodus, with 25 extra Magnum rounds. (2+5=7) In addition, there are 7 rounds left in the starting clip. The first UNSC forces Noble Six after Operation: UPPER CUT meet in the level Exodus are members from Evacuation Team 7. On the level Exodus, the player can find an ad on the "world cuisine" store for a Moa burger combo costing 7.77 cR. In the beginning of the level The Package, the time is shown as 26:16. 26+16=42=6×7. Pressing the hidden switch in the level "The Package" results in the tribute room door opening and 7 Sangheili Generals emerging out of it. There are 14 engines on the back of the UNSC Pillar of Autumn. 14/2=7. At the very end of the credits, in Auntie Dot's grid, the number 7 flashes briefly before fading to the "Lone Wolf" level. Noble Six battles 7 Sangheili in the ending cutscene of the level Lone Wolf. The ending cutscene of the level "Lone Wolf" take place on July 7th, 2589. July is the 7th month of the year. This is also a reference to Bungie Day. The year is also a seven reference: 2+5=7; 8+9=17, 1x7=7. There are 7 Sangheili Zealots encountered in the game, the first two being in the level Winter Contingency, the next one in the mining facility in Tip of the Spear, a further three in the final section of the level The Pillar of Autumn, and the final one in Lone Wolf who slashes Noble Six with its energy dagger. The Pillar of Autumn utilizes R7 thrust couplings to lift off the surface of Reach. In the multiplayer gametype Invasion, when the countdown goes below 7, it will only recharge back up to 7. It is a common occurrence to get 777 on the matchmaking post game slot machine. The Jackpot for this is 7777. On Legendary difficulty, enemies inflict 77% more damage than on Normal difficulty. Dr. Elias Carver's initial formula for "the matrix mechanics of the socio- and politico-economic vectors of human expansion" utilized 7 dimensional parameters. Six number 7's are written beside a caricature of a dead Carver. Halsey refers to the piezoelectric effect as a 700+-year-old technology. Halsey reports that standardizing UNSC operating systems over the last seven decades left them vulnerable to the insurgency. On July 29, 2549 Halsey states "Only seven weeks to the completion of my personality transfer." Cortana was activated November 7, 2549 or 11/7/49. 49=72 The month and day date may also be a reference to John-117's service number. Miranda Keyes was decorated for her actions aboard the UNSC Hilbert at the Battle of Gamma Pavonis-VII. Halsey mentioned a seventh iteration of the MJOLNIR armor. There are a total of 7 blank pages at the end of Halsey's journal. All the references from the original game apply here. The player has to escape the Flood containment facility within 21 minutes to get the Breaking Quarantine achievement. 21 ÷ 3 = 7. The Anniversary Map Pack released with the game is made up of 7 maps. The Anniversary Map Pack includes 7 achievements. The Halo: Combat Evolved Anniversary manual has 7 pages excluding the front and back covers. A Corbulo Academy training bunker is designated as "Field Depot 7". Cadmon Lasky tells his brother that his ODST unit engaged in a 7-hour firefight with Insurrectionists. Cortana mentions that UNSC AIs are supposed to operate for seven years and she has operated for eight. Jul 'Mdama's Covenant faction appears in 7 levels of the game. There's seven Terminals in which the Forerunners are the protagonists. All the Scorpions in the game bear the number 0383. 0 + 3 + 8 + 3 = 14, 14 ÷ 2 = 7. There are 14 rounds in an M395 DMR magazine. 14 ÷ 2= 7. John-117's cryo chamber is designated "16". 1 + 6 = 7. John-117 is awakened by Cortana on July 21st 2557. 21 ÷ 3 = 7. July is also the seventh month of the Gregorian calendar. The UNSC Infinity is 3.5 miles long. 3.5 × 2 = 7. The Assault Rifle can carry up to 7 spare clips. The Suppressor can hold up to 7 total clips (6 spare + 1 active). The Carbine can kill in 7 headshots. In Dawn, there are seven Covenant ships in front of Requiem that are visible. Cortana tells John-117 that he has been in cryosleep for 4 years, 7 months, and 10 days. 4 + 7 + 10 = 21, 21 ÷ 3 = 7. In Requiem, John's M6H magnum starts with 28 (7 active + 21 reserve) rounds. 28 ÷ 4 = 7. In the level Forerunner, Captain Del Rio can be heard ordering his officers to "increase [Infinity's] speed by point seven." When the Infinity is pulled into Requiem, Cortana calculates its impact site will be 77.8 kilometers away from them. Seven can be seen written on two panels near the front of the Mammoth's mini-MAC cannon. Pelican Papa Foxtrot 766 is designated "Gypsy Seven". The Ivanoff Station hangar bay John-117 secures is hangar bay 7. Ivanoff Station has 7 excavation-grade HAVOK mines. In Composer, Cortana captures Sandra Tillson's biosignature at 350-level, B deck. 350 ÷ 50 = 7. In Midnight, seven Cortana avatars attack the Didact. Seven missions have the assault rifle as a starting and usable weapon. On Requiem, there are multiple known named Pelicans, two of which include 653 and 595. 6 + 5 + 3 = 14, 14 ÷ 2 = 7. 595 ÷ 85 = 7. At the end of the opening cinematic of Memento Mori, Spartan Gabriel Thorne is surrounded by seven Sangheili Storm warriors. In Issue #3, a UNSC Marine designated Blue Leader contacts "Site Seven" to establish connection to command. There are 7 different anime shorts in Halo Legends. There is a 7 in the sky just before the battle in the desert. 7 residents of planet Cronkee are spoken of in the episode, including the AI "Mama" and the dinosaur. The UNSC ship at the beginning of the episode is numbered "993". The average of these three numbers is 7. When Frederic-104, Kelly-087, and John-117 enter the Resplendent Fervor, Kelly says, "We got three minutes", indicating that the space battle lasted 7 minutes in their 10 minutes mission time. The battle between John-117 and Thel 'Lodamee lasts 7 seconds. Ralph-103 mentions to Daisy-023 that it has been 7 years since they were abducted to participate in the SPARTAN-II program. 7 humans belonged to the crew that assisted Bornstellar Makes Eternal Lasting in inevitably finding the Cryptum of the Didact. New Llanelli was glassed 7 years before the Human-Covenant War ended, as remarked by Tom Muir, who complains that the UNSC's presence during the events of Halo: Glasslands were 7 years too late. Lucy-B091 suffered from a speech impediment for 7 years. Lucy referred to Morse code as a "simple, seven-hundred-year-old system of on-off signals. Fred and Mendez go up seven floors in the Forerunner elevator. At the Voi Memorial ceremony, Malcolm Geffen and the other Kilo-Five ODSTs wore their dress uniforms for more than seven hours. As Chakas and Vinnevra visit a crashed Forerunner escape pod, Chakas counts the partial remains of about 7 dead Forerunners. The Forerunner Lifeworker Genemender Folder of Fortune is said to have 7-fingered hands. The victorious Forerunner assault on the humans at Charum Hakkor were staged of 7 slipspace portals. 7000 human warriors and 70 human vessels were assigned to protect the timelock that contained the Timeless One. The flashbacks of 343 Guilty Spark, formerly known as Chakas, primarily take place on Installation 07, one of the 7 Halo rings. Far Nomdagro is located seven lightyears from the Capital system. Audacity had a crew of seven during its expedition to Path Kethona. During a survey of a star system in Path Kethona, Audacity's sensor readings are disrupted by unknown objects less than seven hundred million kilometers from the star. The fifth planet in the star system investigated by the Audacity is surrounded by seven rings of icy debris. After discovering a fleet of ancient Forerunner vessels, the crew of the Audacity choose to investigate an outlying group of seven vessels. Among the ancient Forerunner warships are what the Librarian assumes may be classified as sixth- or seventh- order ships. During the Battle of the 78th Thema, twelve Fortress-class vessels are placed as apex control stations for seven hundred thousand Harrier-class vessels. Requiem is orbited by seven ice-covered resource planetoids. In the beginning of Issue #1, Fireteam Jackknife and Sarah Palmer are seen following a lance of seven Covenant members (three Unggoy, three Sangheili, and one Kig-Yar). At the end of the Battle of Ealen IV in Issue #3, a total of seven SPARTAN-IVs die. Issue #7 reveals that seven million people died in the New Phoenix Incident. Seven Sangheili are killed during the Skirmish of the Planet of Blue and Red. The Refuge/Broken Circle is divided into seven sections. Ray Kurzig reveals that Deon Govender died seven years ago. Petra Janecek checked for facts about the Raid on Biko peace talks for seven hours. There are 117 pieces of intel to collect. 1 × 1 × 7 = 7. Limited and Limited Collector's Editions came with 14 Warzone REQ packs, 2 of which were released per week, for 7 weeks total. One of the original Warzone maps is called Raid on Apex 7. The Maps Battle of Noctus and Urban are set on sector 07 in the city of Noctus, in the planet Andesia. Meridian is the 7th satellite orbit of Hestia V.
The River of Light Incineration Cannon fires a burst of 7 arced, explosive hardlight projectiles with its fully charged shot. The Needlers and White Scar plasma caster's needles supercombine in 7 rounds, much like the Needler from Halo: Combat Evolved and Halo 3. There are 63 available visors. 63 ÷ 9 = 7. The campaign features 14 special weapons that can be collected by players (excluding repeats, the Co-op-only Oathsworn, and the Prophets' Bane from the Legendary-only Flaming Knives on Osiris easter egg). 14 ÷ 2 = 7. 14 of the 15 campaign missions in the game feature at least one Covenant weapon. 14 ÷ 2 = 7. 14 of the 15 campaign missions in the game also feature at least one member of Fireteam Osiris. 14 ÷ 2 = 7. 7 of the 8 playable characters in the campaign have M9 frag grenades and at least one precision weapon (e.g. M6H2 magnum, M395B DMR) included in their loadout. 7 of the 8 playable characters say the word "thanks" upon being revived. 7 of the 8 playable characters each say one of two different lines when assassinating an enemy. There are 7 enemies in the campaign and Warzone that can be assassinated (excluding Spartans and Marines): Grunts, Jackals, Elites, Crawlers, Soldiers, Knights, and the Warden Eternal. In Blue Team, the PA announces that the reactor core temperature has exceeded 1373 Kelvin. 1 + 3 + 7 + 3 = 14, 14 ÷ 2 = 7. In Glassed, the garage holding the Scorpion that Osiris obtains with the help of Governor Sloan is designated with the number 14. 14 ÷ 2 = 7. The missions that take place on Genesis feature a total of 7 bodies of the Warden Eternal that are fought in gameplay: 1 in Reunion, 3 (1 + 2) in Genesis, and 3 in The Breaking. The Flaming Knives on Osiris easter egg on the mission Osiris involves seven combat knives that must be shot. The Suppressor's magazine consists of 42 rounds. 42 ÷ 6 = 7. The Assault Rifle, SPNKr Prime SPNKr Rocket Launcher, and Dying Star LightRifle can hold up to 7 total clips (1 active + 6 reserve). The Railgun can hold up to 14 total slugs (1 active + 13 reserve), while its Whiplash variant can hold up to 14 total reserve slugs. 14 ÷ 2 = 7. There are 7 total Brute weapons, including both normal variants and REQ-obtainable variants: 3 Brute Plasma Rifles and 4 Gravity Hammers. There are 7 total UNSC rocket launcher-type weapons, including both normal variants and REQ-obtainable variants: 3 M57 Rocket Launchers and 4 SPNKr Rocket Launchers. There are 7 total UNSC turrets, including both normal variants and REQ-obtainable variants: 3 Chaingun Turrets, 2 Gauss Turrets, and 2 Rocket Pod Turrets. The Carbine can get a Perfect Kill on a Spartan with 7 headshots. The Open Hand Boltshot kills a Spartan in 7 rounds (2 full bursts + 1/3 burst). The par time of the mission Guardians is 28 minutes. 28 ÷ 4 = 7. The Answer SAWs can have up to 3.5 spare clips. 3.5 × 2 = 7. SMGs with Extended Mag attachments have 84-round magazines. 84 ÷ 12 = 7. The planet Genesis has a name that is seven letters long. The M57 Pilum Assault Weapon, also known as the Rocket Launcher, has a firing rate of 63 RPM and a reload time of 4.2 seconds. 63 ÷ 9 = 7, 4.2 ÷ 0.6 = 7. The Memories of Reach Pack, which is themed around NOBLE Team, can be bought 7 times for the full set. This requires a total of 840,000 RP. 84 ÷ 12 = 7. In the level From the Deep, there are 7 watchtowers stationed around the map. Alice's base in From the Deep has 7 starting structures. On the level Lights Out, Jerome starts with 7 units. There are 7 Marines and 7 Hellbringers at the start of the level Last Stand. There are 7 wave of UNSC reinforcements on the level Last Stand. There are 7 Marines and 7 Hornets in total at The Signal. On the level The Archive, Voridus starts with 7 units. There are total of 7 units from India Company that were not captured on the level Gatecrashers. Cortana's name is seven letters long. Most of the Halo series is set in years beginning with the number 25. 2+5=7 The vast majority of the game trilogy is set in 2552. 5 and 2 is the exact same equation, per order of operations. In the Halo series there are 7 levels named after a Halo character: 343 Guilty Spark, Keyes, The Arbiter, Regret, Gravemind, Sierra 117, and Cortana. Smart AIs (such as Cortana) go rampant after seven years of activation. Most family names of Sangheili have 7 letters, including the 'ee' suffix for military service (e.g., Vadumee, Zamamee, Vadamee). The Human-Covenant War lasted a total of 28 years. 28 is divisible by 7, 28/4=7. All known "Monitor" Forerunner A.I. 's have I.D. numbers that are powers of seven. There are 7 active Halo rings. The cryonic put-down cycle takes seven minutes. The ASCII Master Chief in a Bungie Weekly Update was made with 7s. In the preview of Halo 3 featured at the Seattle IMAX theater, Bungie gave away a prize to the person sitting in seat G7 (G is the 7th alphabet). ↑ Halo: Combat Evolved: Sybex Official Strategies & Secrets, page ?? ↑ Halo: First Strike, page ? ?